Luxurious, 2 bedroom suite + den available in the heart of downtown Ottawa with breathtaking views of the Byward market, Gatineau Hills, and Parliament Hill. Steps away from Ottawa’s best shopping, dining, and cultural attractions, including the Byward Market, Rideau Centre, NAC and the National Art Gallery. Featuring hardwood flooring in the living/dining room, tile flooring in the kitchen, bathrooms, and entry. Kitchen features a breakfast bar, master bedroom enjoys a 3-piece ensuite bathroom, good size second bedroom, plus 3-piece main bathroom and, in-unit laundry. 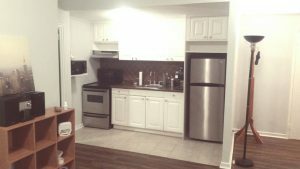 All 6 appliances are included (oven, over the range microwave, dishwasher, refrigerator, stackable washer/dryer). This condo is ideal for young professionals, students, or investors alike. The unit is currently rented! Underground heated parking space and storage locker included. First-class building with full time concierge, indoor salt water pool, sauna, exercise room, party room, outdoor terrace. Condo fees include heat and water. Schedule your viewing today!! !